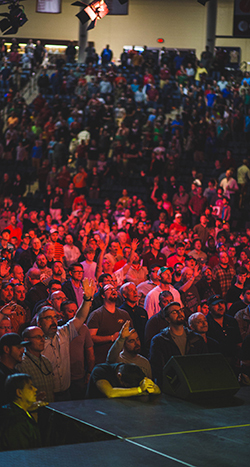 Imagine joining 10,000 men—fathers, sons, brothers, seekers and Christ-followers—coming together to worship God and learn more about the life of true adventure He intends for us. Even more, imagine a two-day event packed full of workshops, exhibits, and fun around the stuff that men love: hunting, fishing, football, motorcycles, racing, extreme sports, and other outdoor activities—featuring some of the leading experts in the world. Welcome to Ignite Men’s Impact Weekend Conference! After years of perfecting our men’s impact weekend, we have landed on a unique format that helps men align their everyday passions with God’s eternal purpose. We are here to take on the everyday challenges that men face—a godless culture, fatherlessness, broken relationships, and the lack of male leadership in the Church. This ground- breaking, extreme weekend is scheduled for March 15-16, 2019 at Thomas Road Baptist Church in Lynchburg, Virginia.